1st Battery: Reporting, on November 20, at New Iberia, Louisiana with four 12-pdr Napoleons and two 3-inch guns. Captain Martin Klauss remained in command of this battery. With the realignments of divisions after the fall of Vicksburg, the battery’s parent formation became First Division, Thirteenth Corps. The battery participated in the campaign against Jackson, Mississippi, in July. Then it moved with the rest of the division to New Orleans, in August, to join the Department of the Gulf. There, the battery was assigned to the District of La Fourche and supported the Teche Country expedition in October. Lieutenant Lawrence Jacoby lead the battery while Klauss was absent during the fall. 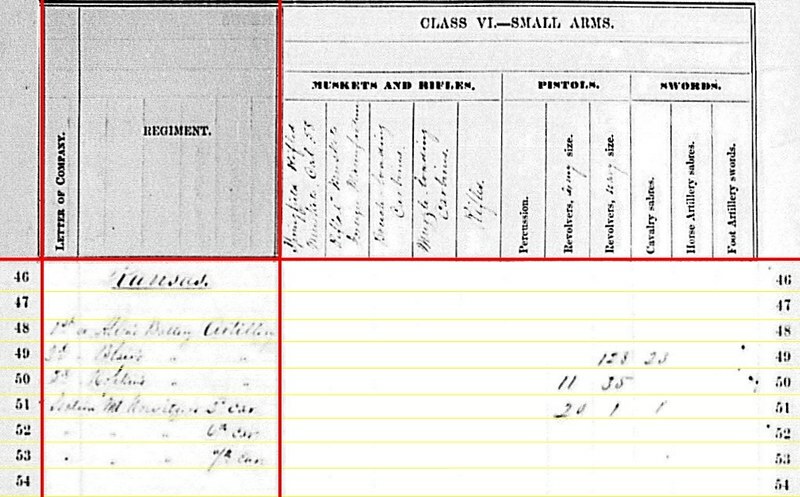 2nd Battery: Reporting at Springfield, Missouri with two 6-pdr field guns and four 3.80-inch James Rifles. Captain John W. Rabb was the senior officer of the battery. 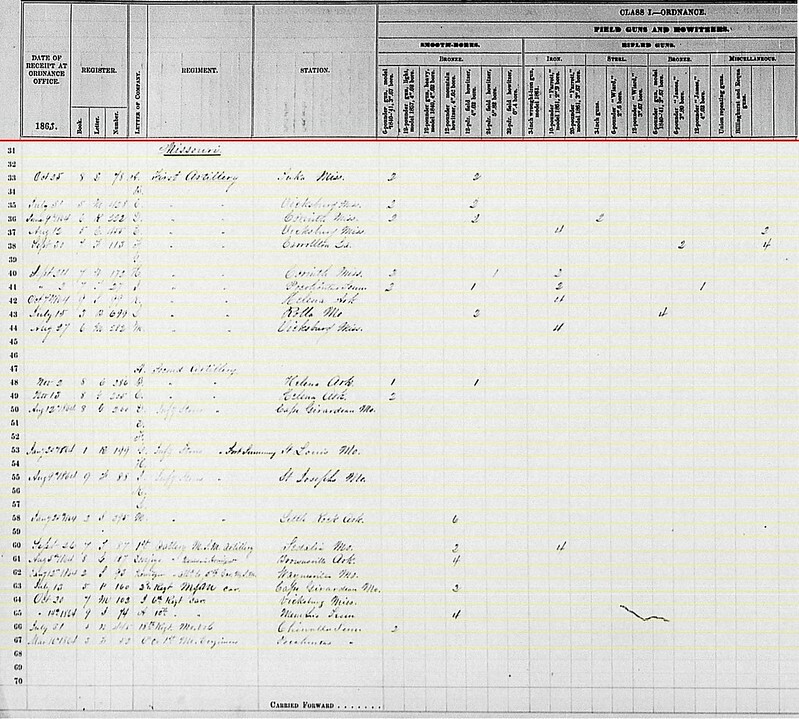 But that fall Rabb accepted a job in the reformed 2nd Missouri (Light) Artillery Regiment. Lieutenant Hugh Espey, as mentioned in previous quarters, commanded this battery in the field. The battery remained with the Department of Southwestern Missouri, and served in sections, with 1st and 2nd Sections under Lieutenant William W. Haines. After a hard season campaigning in Missouri, Arkansas, and Indian Territories, the battery move to the Department of the Frontier. 3rd Battery: At Rolla, Missouri with two 6-pdr field guns, two 12-pdr Napoleons, and two 3.80-inch James rifles (as opposed to 3.67-inch rifles the previous quarter, which raises a question). Captain James M. Cockefair remained in command of this battery. The battery split duty between Rolla and St. Louis through the early fall, being assigned to the District of Rolla and later District of St. Louis. In November, the battery reenlisted with “veteran” status. 4th Battery: At Chattanooga, Tennessee with two 12-pdr Napoleons, two 12-pdr field howitzers and one 3.80-inch James Rifles. The battery remained with First Division, Fourteenth Corps. Lieutenant David Flansburg led this battery into action at Chickamauga, with “great coolness and bravery.” But Flansburg was wounded and captured on September 19. 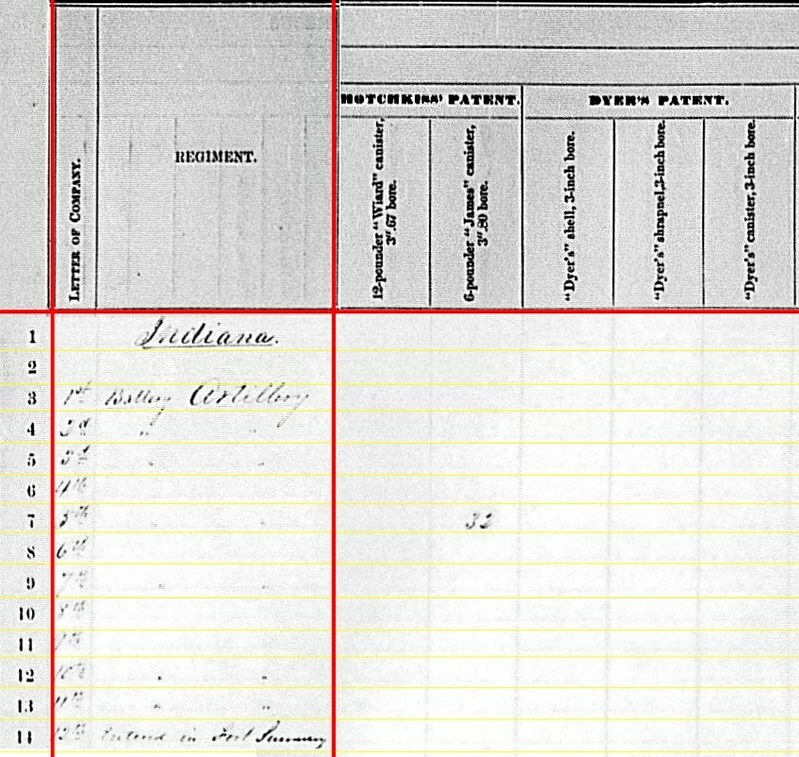 Lieutenant Henry J. Willits took his place. In addition to their commander, the battery lost a James rifle, a caisson, three pistols, six sabers, and thirty-four horses in the battle. 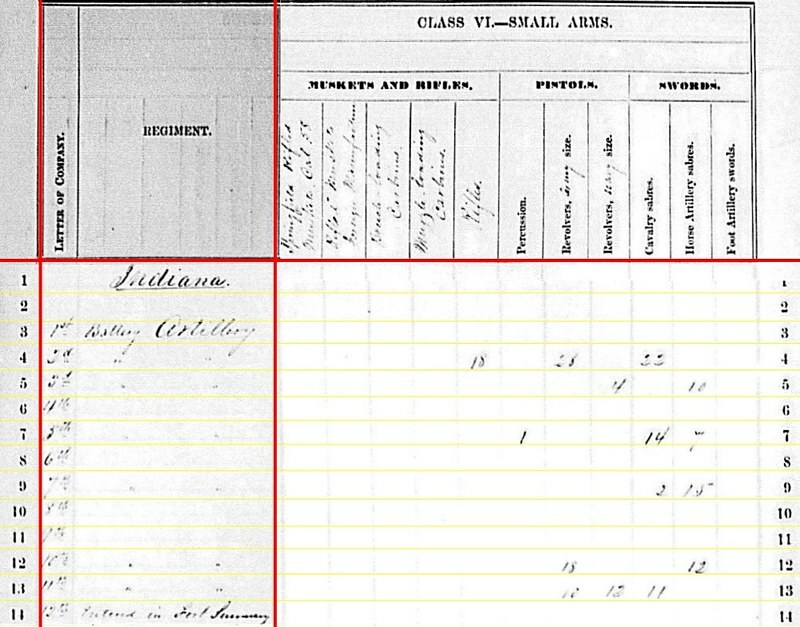 While in prison, Flansburg was promoted to Captain, with September 30 as his date of rank. 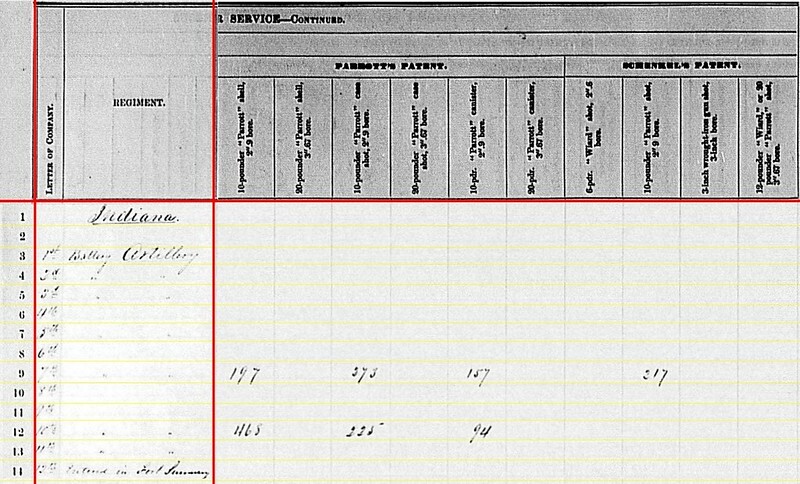 He was among the officers who escaped, from Libby Prison, Richmond, in February 1864, but was re-captured. Flansburg would die in November of that year, still a prisoner, and is buried in Florence, South Carolina. 5th Battery: No return. The battery remained with First Division, Twentieth Corps. Thus at the end of September, the battery was under siege in Chattanooga. At the start of September, Captain Peter Simonson was relieved of duties as division artillery chief and returned to his battery in time to lead it into battle at Chickamauga. Heavily engaged, the battery fired 1,247 rounds. Twice having to withdraw to resupply. In the final tally, Simonson reported one killed, eight wounded, and one missing; and thirty horses lost. Material losses included one 12-pdr Napoleon and one 3.80-inch James rifle, leaving the battery with one Napoleon and three James rifles. Reorganizations of the Army of the Cumberland would put the battery in Fourth Corps later in the fall. 6th Battery: No report. 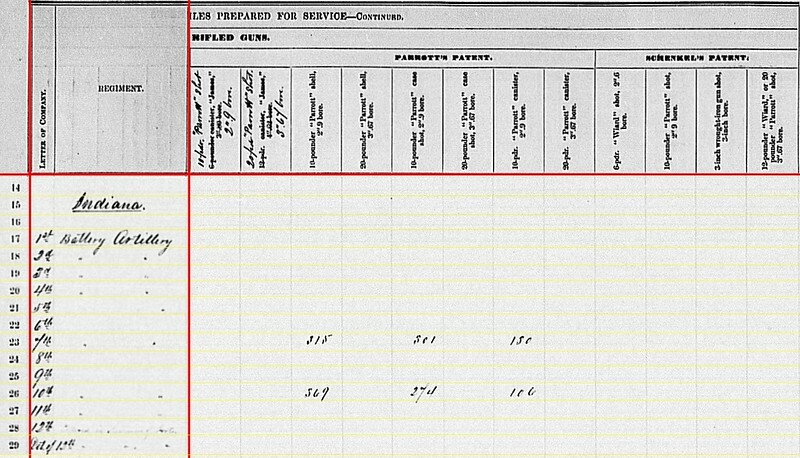 Going back to the first quarter’s returns, the battery had two 6-pdr field guns and two 3.80-inch James Rifles. After Vicksburg, the battery moved from Sixteenth Corps to Third Division, Fifteenth Corps. Captain Michael Mueller remained in command. 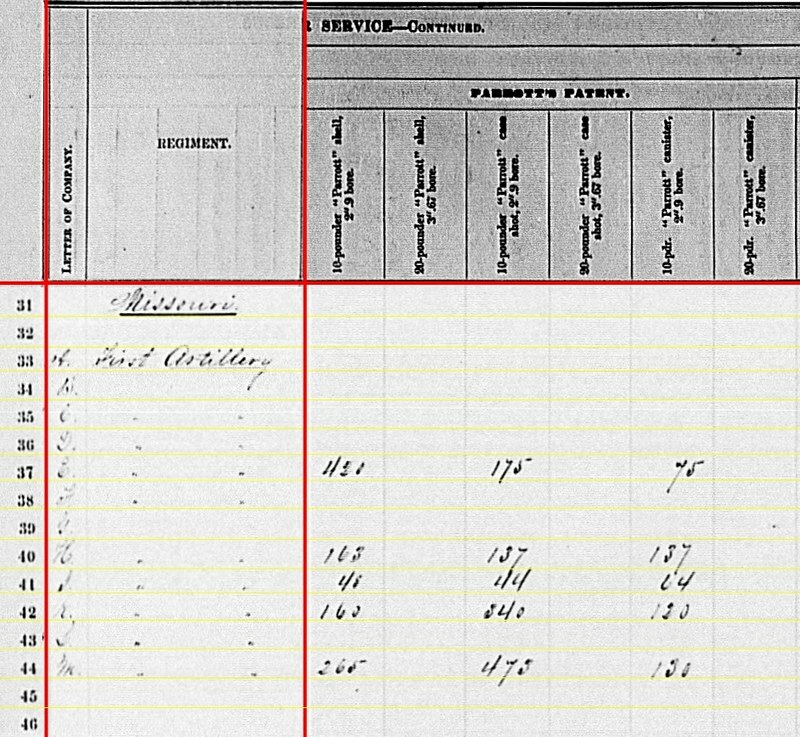 Mueller’s battery was still around Vicksburg at the end of September. 7th Battery: Reporting at Chattanooga, Tennessee, with two 12-pdr Napoleons and three (down from four) 10-pdr Parrotts. The battery supported Third Division, Twenty-First Corps. Captain George R. Swallow remained in command, but also served as division artillery chief. The battery expended all their canister in close action on September 19. Then on September 20 was again heavily engaged. As alluded to with the numbers, the battery lost a Parrott rifle in the battle. 8th Battery: No return. Captain George Estep retained command of this battery, part of First Division, Twenty-First Corps. The battery brought four 6-pdr field guns and two 12-pdr field howitzers into battle at Chickamauga. The battery fought a bitter and close fight, suffering one killed, eight wounded and nine missing in the battle. Furthermore, the battery lost all its cannon. In October, the battery was assigned to Chattanooga’s garrison artillery and temporarily in charge of a pool of horses. By November, the battery maned Fort Jefferson C. Davis, with three 20-pdr Parrotts. 9th Battery: No return. Lieutenant George R. Brown commanded this battery from Sixteenth Corps. At the end of September, Brown’s battery was part of the garrison at Union City, Tennessee. 10th Battery: Reporting at Chattanooga, Tennessee with two 12-pdr field howitzers and four 10-pdr Parrotts. Captain William A. Naylor (promoted in June) remained in command of this battery, assigned to First Division, Twenty-First Corps. During the fighting at Chickamauga, the 10th was part of the force left behind to guard Chattanooga, and was thus not engaged in the battle. 11th Battery: Also at Chattanooga, Tennessee, with four 12-pdr Napoleons. Captain Arnold Sutermeister’s battery supported Third Division, Twentieth Corps. During the Federal route on September 20, the section with two 3-inch Ordnance Rifles was overwhelmed, having all their horses shot. The battery lost three killed, twelve wounded, and four missing, and nineteen horses. The battery expended 120 rounds. 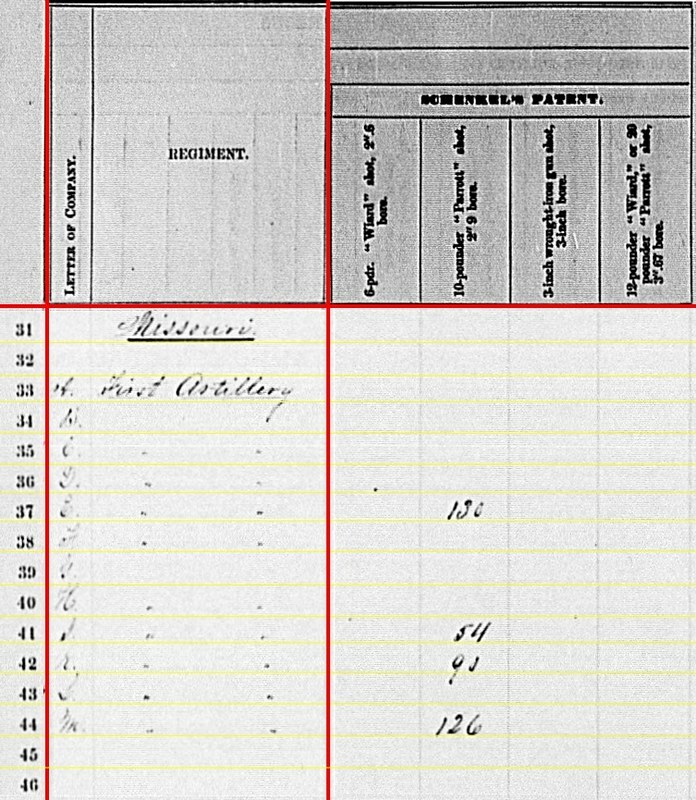 12th Battery: Reporting at Fort Negley, Nashville, Tennessee as siege artillery. We know the battery had four 4.5-inch Ordnance siege rifles around this time. Captain James E. White remained in command. 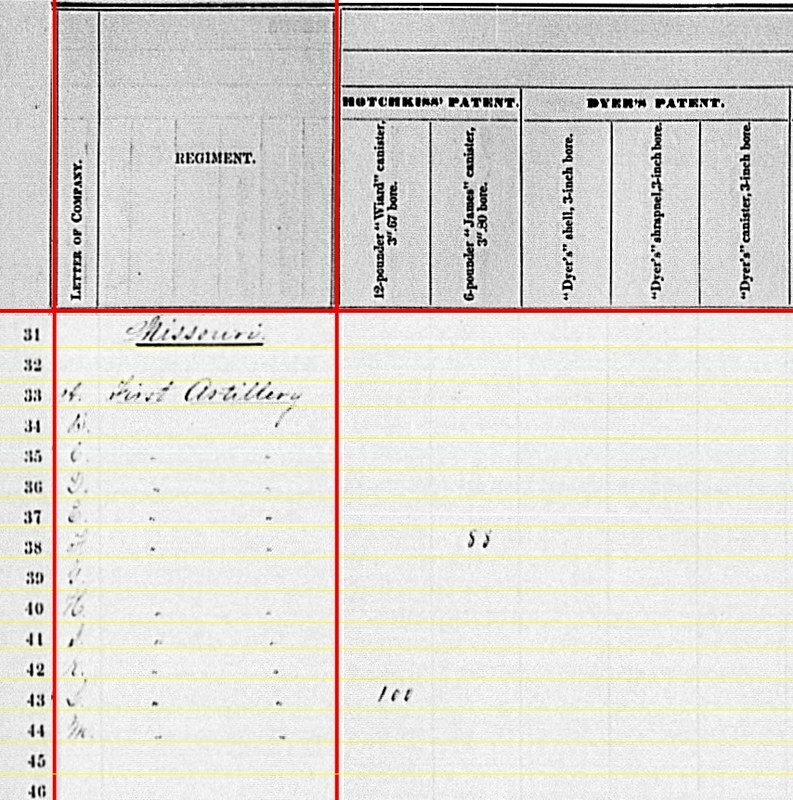 White also presided over the 20th Indiana battery, which was also stationed at Nashville. However, see the next line…. Detachment of 12th Battery: At Fort Wood, Chattanooga, Tennessee. No other details offered. Lieutenant James A. Dunwoody commanded a detachment, about half of the battery, dispatched to reinforce Chattanooga that fall. They arrived in November. 1st Battery: 198 shell, 250 case, and 46 canister for 12-pdr Napoleons. 2nd Battery: 193 shot, 175 case, and 71 canister for 6-pdr field guns. 3rd Battery: 105 shot, 141 case, and 132 canister for 6-pdr field guns; 136 shot, 406 shell, 224 case, and 300 canister for 12-pdr Napoleons. 4th Battery: 48 shot, 24 shell, 65 case, and 24 canister for 12-pdr Napoleons; 40 shell, 74 case, and 50 canister for 12-pdr field howitzers. 7th Battery: 74 shot, 33 shell, 79 case, and 63 canister for 12-pdr Napoleons. 10th Battery: 111 shell, 100 case, and 116 canister for 12-pdr field howitzers. 11th Battery: 127 shot, 113 shell, 106 case, and 100 canister for 12-pdr Napoleons. 1st Battery: 46 canister, 31 percussion shell, and 160 fuse shell for 3-inch rifles. 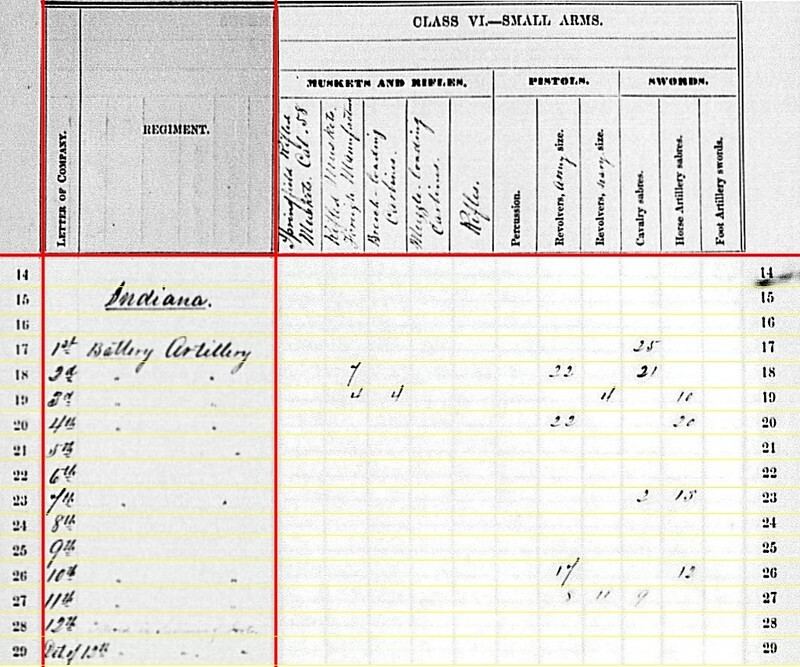 2nd Battery: 195 percussion shell, 217 fuse shell and 168 bullet shell for 3.80-inch James rifles. 11th Battery: 80 canister, 100 fuse shell, and 120 bullet shell for 3-inch rifles. Yes, the battery still had ammunition chests for the two rifles lost at Chickamauga. 2nd Battery: 58 canister for 3.80-inch rifles. 4th Battery: 2 canister for 3.80-inch rifles. 2nd Battery: 111 shot and 199 shell for 3.80-inch rifles. 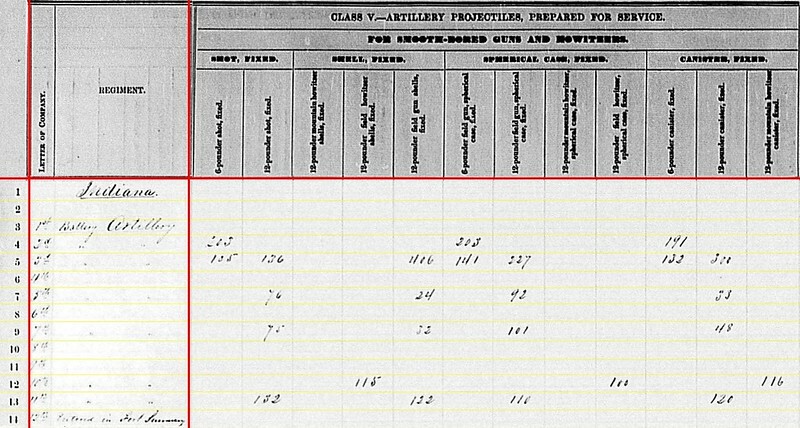 3rd Battery: 52 shot, 173 shell and 24 canister for 3.80-inch rifles. 4th Battery: 4 shot for 3.80-inch rifles. 7th Battery: 315 shell, 301 case, and 130 canister for 10-pdr Parrott. 10th Battery: 369 shell, 274 case, and 106 canister for 10-pdr Parrott. 1st Battery: 174 shell for 3-inch rifles. 4th Battery: 64 shell for 3.80-inch rifles. 4th Battery: 9 canister for 3.80-inch rifles. 1st Battery: Twenty-five cavalry sabers. 2nd Battery: Seven rifled muskets of foreign manufacture, twenty-two Army revolvers, and Twenty-one cavalry sabers. 3rd Battery: Four foreign rifled muskets, Four breechloading carbines, four Navy revolvers, and ten horse artillery sabers. 4th Battery: Twenty-two Army revolvers and twenty horse artillery sabers. 7th Battery: Two cavalry sabers and thirteen horse artillery sabers. 10th Battery: Seventeen Army revolvers and twelve horse artillery sabers. 11th Battery: Eight Army revolvers, eleven navy revolvers, and nine cavalry sabers. Considering the service of these twelve batteries from Indiana, we find a fair cross section of western service. Batteries campaigning in east Tennessee, along the Mississippi, and in the Indian Territories. Also a sampling of field, garrison, and heavy battery service. But the heavy hitting stories come from northern Georgia near a creek called Chickamuaga. 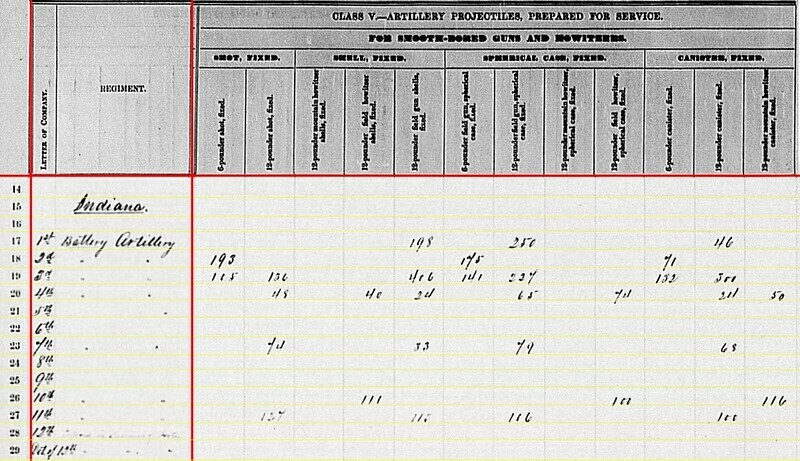 We see some of the ferocity of that battle reflected in the numbers – specifically batteries reporting fewer cannons and limited ammunition supplies, but likewise the absence of reports from the 5th, 8th and 9th Batteries. And we can match those with the tally of losses, to include men and horses, from the official reports. 1st (Allen’s) Battery: No report. 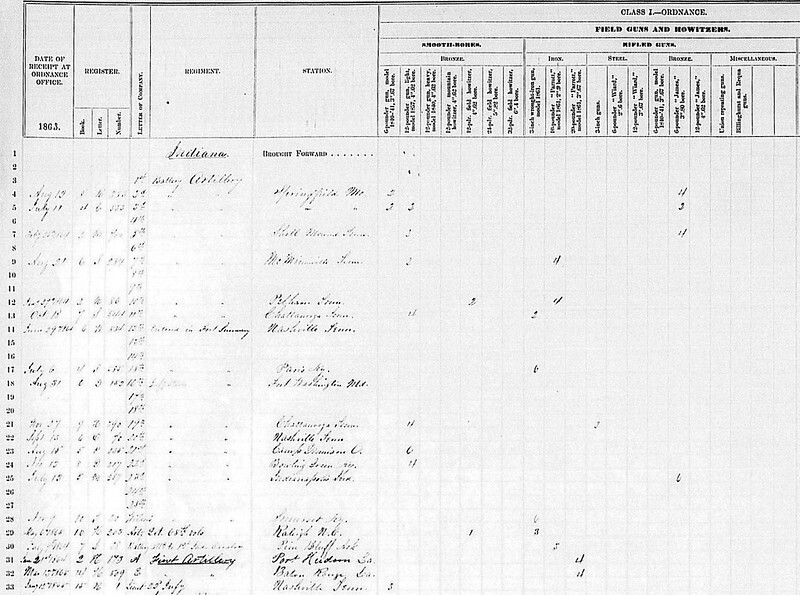 A June 30, 1863 return had Captain Norman Allen’s battery assigned to the District of Rolla, Missouri. Presumably still with six 10-pdr Parrotts from the previous quarter. Allen was absent from the battery through much of the first half of the year, and died in St. Louis in July. Lieutenant (later Captain) Marcus Tenney replaced Allen. 2nd (Blair’s) Battery: Fort Blunt, Cherokee Nation (adjacent to Fort Gibson) with two 12-pdr Napoleons and four rifled 6-pdrs (3.67-inch rifle). Captain Edward A. Smith remained in command. 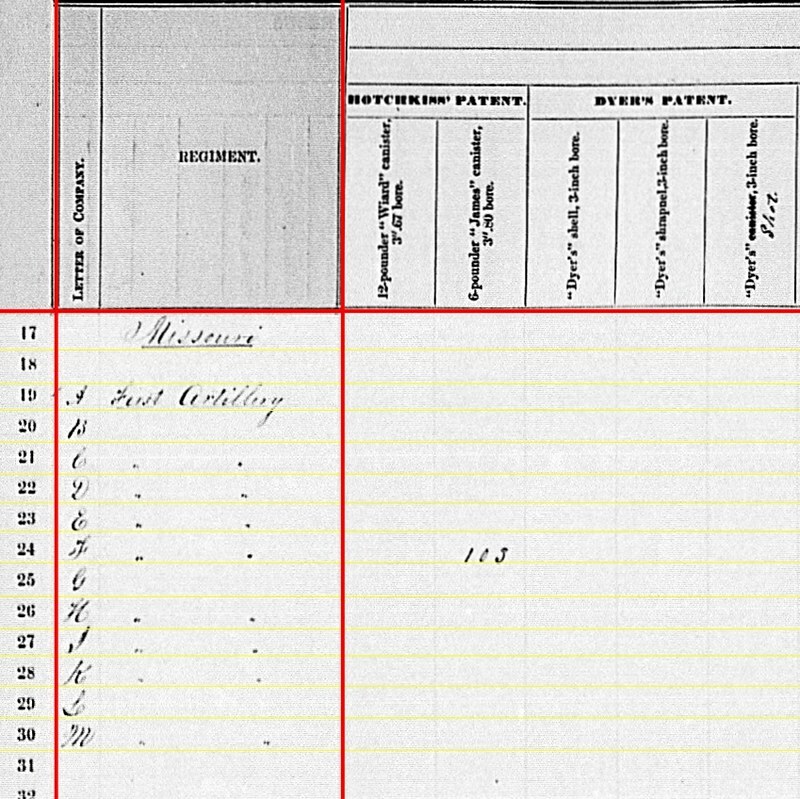 According to returns, the battery was, in June, still at Fort Scott, Kansas, as part of the District of the Frontier. By September, when the return was received in Washington, the battery had moved into the Cherokee Nation. Of note, this battery was in action on July 17 at Honey Springs. 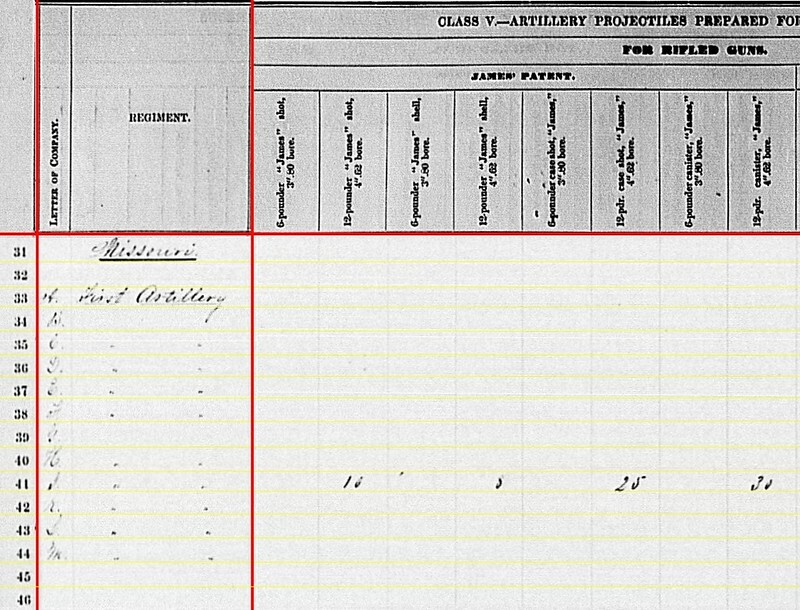 In his report, Smith listed his charge as, “two 12-pounder brass guns and two 6-pounder iron guns“. I will speculate about this below. 3rd (Hopkin’s) Battery: At Fort Gibson, Cherokee Nation, with three 6-pdr field guns and one 12-pdr field howitzer. Captain Henry Hopkins remained in command of this battery, operating with the Indian Brigade and four companies of the 6th Kansas Cavalry, at Fort Gibson. And we’ll see more from the 6th Cavalry below. Section, Mt. Howitzers, 2nd Cavalry: At Springfield, Missouri with two 12-pdr mountain howitzers. Eight companies of this regiment were at Springfield under Major Julius G. Fisk. Lieutenant Elias S. Stover was probably still in charge of this section. Stover was promoted to Captain later in the year. Section, Mt. Howitzers, 6th Cavalry: At Camp Dole, Cherokee Nation with two 12-pdr mountain howitzers. Captain John W. Orahood is listed as commanding a detachment of the regiment then at Fort Gibson at the end of June. Later in July, Lieutenant-Colonel William T. Campbell was in command of that detachment (up to five companies). I don’t have a name of the officer (commissioned or non-commissioned) assigned to the howitzers. Also I’m not certain as to the place-name of “Camp Dole.” That surname is that of both an Indian Agent and an officer of the Indian Brigade. So we might assume the place was near Fort Gibson, where the 6th Cavalry was operating at the time. Section, Mt. 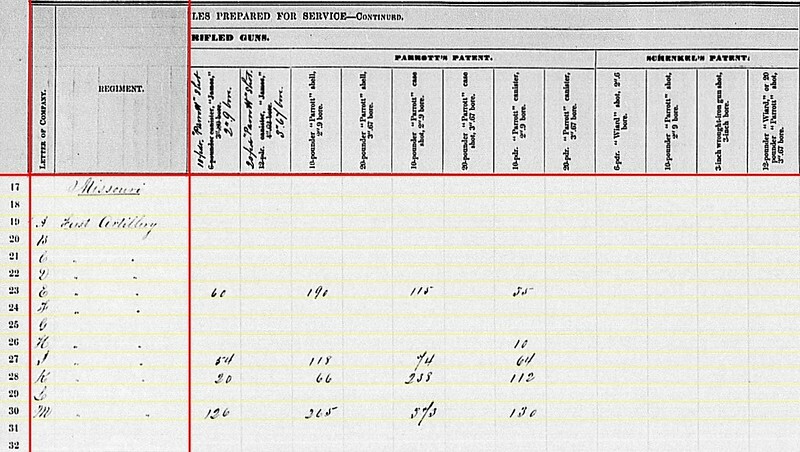 Howitzers, 7th Cavalry: Listed at Fayetteville, Tennessee, but with no cannon reported. Colonel Thomas P. Herrick’s regiment was assigned to the Sixteenth Corps, and operated in west Tennessee around the Memphis area. I presume this placename refers to LaFayette there. With no cannon mentioned on the report, we will look at stores. That’s the basic administrative details for the Kansas units. 2nd Battery: 444 shot, 564 case, and 478 canister for 6-pdr field guns; 17 shot, 100 shell, 57 case, and 43 canister for 12-pdr Napoleons; 152 canister for 12-pdr howitzer, either field or mountain (as that column was used interchangeably by the clerks). 3rd Battery: 196 shot, 406 case, and 196 canister for 6-pdr field guns; 166 case and 150 canister for 12-pdr field howitzers. Section, 2nd Cavalry: 144 case and 12 canister for 12-pdr mountain howitzers. 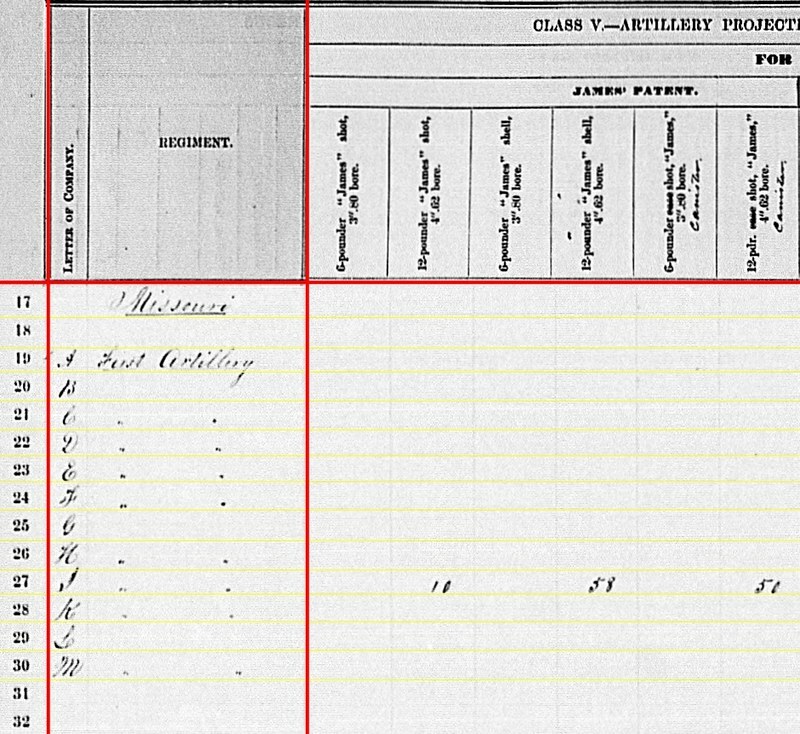 Section, 6th Cavalry: 12 shell, 120 case, and 48 canister for 12-pdr mountain howitzers. Section, 7th Cavalry: 490 Hotchkiss fuse shell and 190 Hotchkiss bullet shell for 3-inch rifles. This would be part of the stores which the 7th Kansas Cavalry had to report. Along with those Hotchkiss shells, the troopers had 900 friction primers, 875 paper fuses, and 837 packing boxes…. all of which the Ordnance Department wanted an accounting. 2nd Battery: 128 Navy revolvers and twenty-three cavalry sabers. 3rd Battery: Eleven Army revolvers and thirty-five Navy revolvers. Section, 2nd Cavalry: Twenty Army revolvers, one Navy revolver, and one cavalry saber. Notice the very small number of edged weapons. Make of it what you wish. Now, let’s talk about Captain Smith’s guns. As indicated above, the summary states these were two 12-pdr Napoleons and four BRONZE rifled 6-pdrs. If we take that literally, those would be a quartet of the “don’t call them James” rifles. But, we have the report from Smith, in which he specifically says he had two 6-pdr iron guns. The discrepancy with the quantity aside (though not an expert on the battle, I seem to recall a section of guns detached), I’m inclined to go with Smith’s description of the guns. If Smith could tell the Napoleons were bronze, then surely he could tell the 6-pdrs were iron! So I would lean towards these being iron guns. But we have the question of smoothbore or rifling. Smith’s report fails to give clues in that regard. The summary indicates his guns had smoothbore ammunition. However, there are a few examples where smoothbore ammunition was employed by rifled guns in the 6-pdr/3.80-inch range. So that is not necessarily definitive. If these were smoothbores, plenty of candidates come to mind – batches of ancient (pre-1830s) guns were still around; private or state purchases, of course; and during the war there were a handful of rare iron types produced – all of which could be properly identified as “6-pdrs”. And, of course, that assumes the caliber identification is a proper one. Likewise, if these were rifled guns, a score of candidates come to mind. I’d say Wiard and Delafield would be unlikely. But Sawyer rifles seemed to get around. And if the caliber (3.67-inch) is not definite, we might even discuss Blakelys. Though I would be quick to point out the use of smoothbore ammunition would be unlikely in those “named” rifles. An interesting detail to track. 1st Battery: No report. The battery remained with Fourteenth Division, Thirteenth Corps and was part of the siege of Vicksburg. The battery had four (some sources say six) James rifles. Captain Martin Klauss commanded. 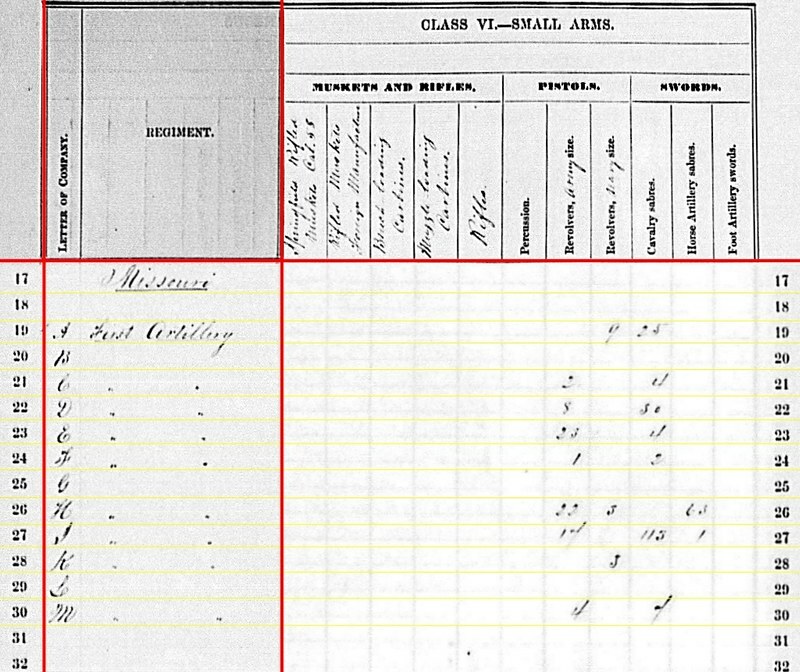 2nd Battery: Reporting at Springfield, Missouri with two 6-pdr field guns and four 3.80-inch James Rifles. Lieutenant Hugh Espey commanded this battery, assigned to the District of Southwestern Missouri. 3rd Battery: Also indicated as at Springfield, Missouri but with two 6-pdr field guns, two 12-pdr Napoleons, and two 3.67-inch rifles. Also part of the District of Southwestern Missouri, Captain James M. Cockefair commanded this battery. The battery split duty between Springfield and Rolla during the summer. 4th Battery: No report. 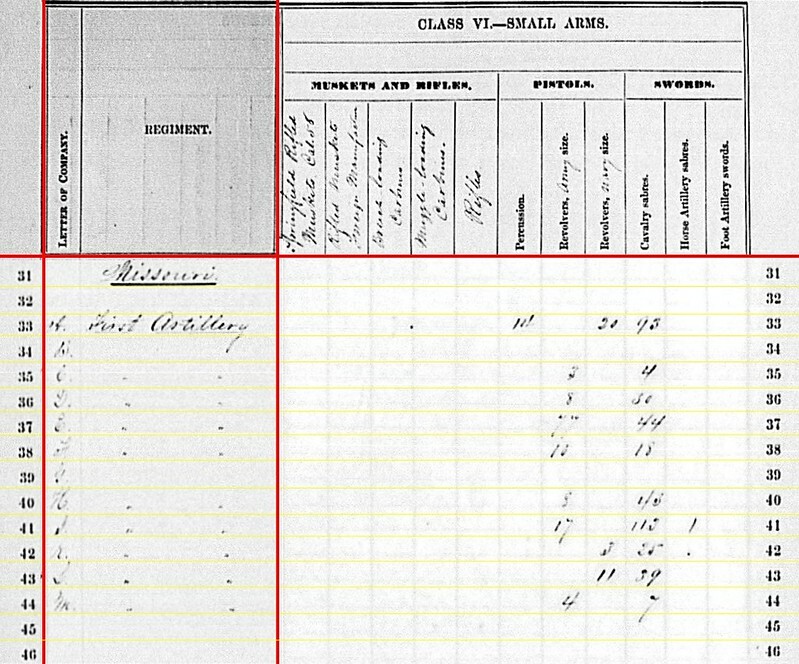 Last quarter found the battery at Murfreesboro, with two 12-pdr Napoleons, two 12-pdr field howitzers, and two 3.80-inch James Rifles. Lieutenant David Flansburg command this battery, assigned to First Division, Fourteenth Corps. So June found them participating in the Tullahoma Campaign. 5th Battery: At Shell Mound, Tennessee with two 12-pdr Napoleons and four 3.80-inch James rifles. Shell Mound was a landing on the Tennessee River downstream from Chattanooga. 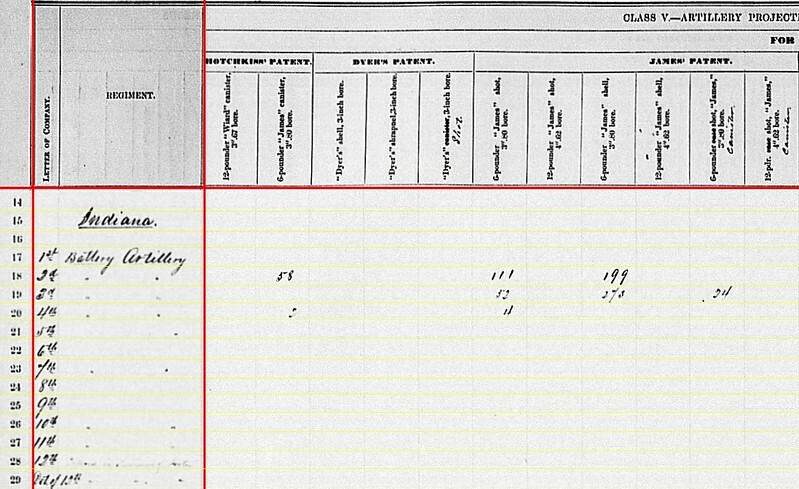 And that location was probably valid for the reporting time of February 1864. In June 1863, the battery was with Second Division, Twentieth Corps, and part of the Tullahoma Campaign. Lieutenant Alfred Morrison remained in command, with Captain Peter Simonson the division artillery chief (temporarily at least). 6th Battery: No report. 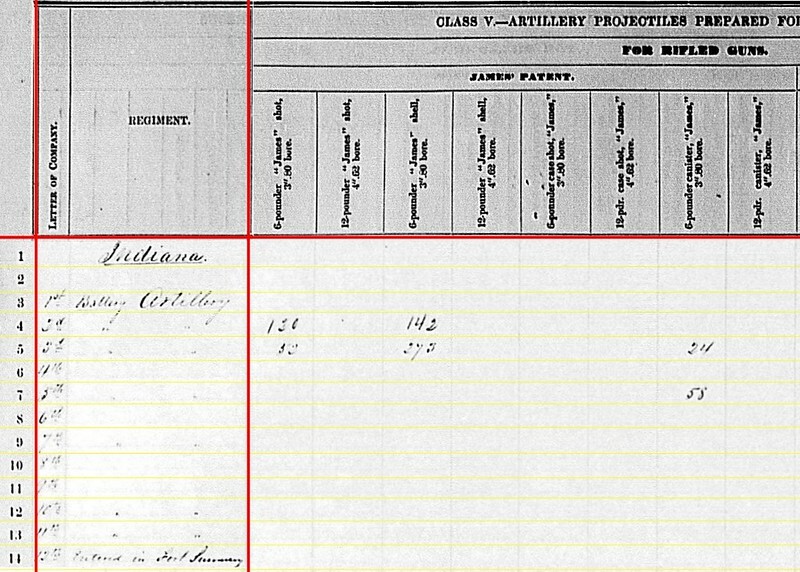 Last quarter’s returns gave the battery two 6-pdr field guns and two 3.80-inch James Rifles. Officially assigned to First Division, Sixteenth Corps. Captain Michael Mueller commanded. The battery had postings across west Tennessee until June, when dispatched with the rest of the division to Vicksburg. 7th Battery: McMinnville, Tennessee with two 12-pdr Napoleons and four 10-pdr Parrotts. Captain George R. Swallow’s battery supported Third Division, Twenty-First Corps. So the battery was involved with the Tullahoma Campaign at the reporting time. McMinnville appears to be derived from the August report filing. 8th Battery: No return. Captain George Estep retained command of this battery. In the winter reorganizations, the battery was posted to First Division, Twenty-First Corps at Murfreesboro. The battery had four 6-pdr field guns and two 12-pdr field howitzers. 9th Battery: No return. Lieutenant George R. Brown commanded this battery, assigned to Fourth Division, Sixteenth Corps. It remained part of the garrison at District of Columbus, in Kentucky. 10th Battery: Reporting at Pelham, Tennessee with two 12-pdr field howitzers and four 10-pdr Parrotts. Lieutenant William A. Naylor remained in command of this battery, assigned to First Division, Twenty-First Corps that winter. At the end of June the battery was involved in the Tullahoma Campaign. 11th Battery: Chattanooga, Tennessee (which was accurate for October 1863 when the report was received) with four 12-pdr Napoleons and two 3-inch Ordnance Rifles. Captain Arnold Sutermeister’s battery supported Third Division, Twentieth Corps and was on the Tullahoma Campaign at the end of June. 12th Battery: At Nashville, Tennessee as siege artillery. 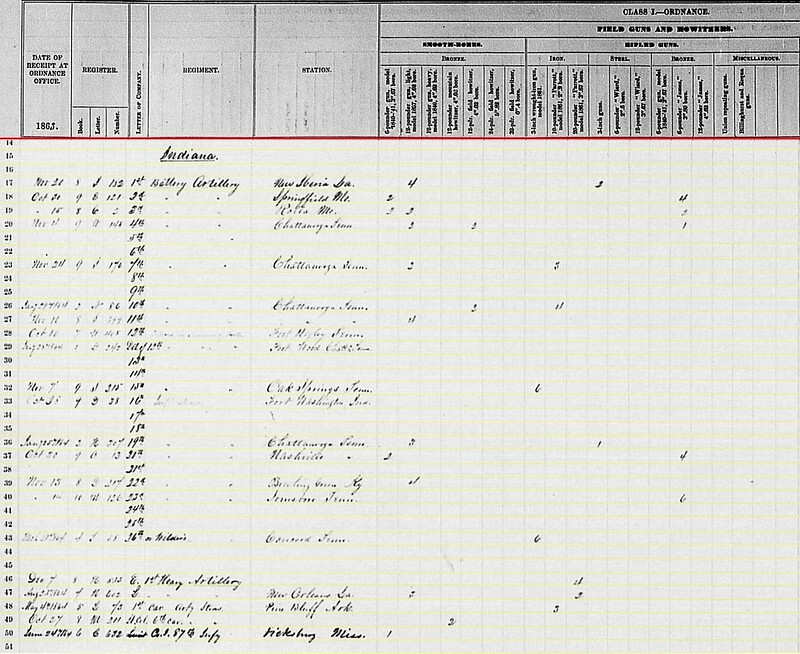 Returns list the battery assigned to Fort Negley, with four 4.5-inch Ordnance siege rifles under Captain James E. White. So we can, using the Official Records mostly, fill in most of these blanks. 2nd Battery: 203 shot, 203 case, and 191 canister for 6-pdr field guns. 3rd Battery: 105 shot, 141 case, and 132 canister for 6-pdr field guns; 136 shot, 406 shell, 227 case, and 300 canister for 12-pdr Napoleons. 5th Battery: 76 shot, 24 shell, 92 case, and 33 canister for 12-pdr Napoleons. 7th Battery: 75 shot, 32 shell, 101 case, and 48 canister for 12-pdr Napoleons. 10th Battery: 115 shell, 100 case, and 116 canister for 12-pdr field howitzers. 11th Battery: 132 shot, 122 shell, 110 case, and 120 canister for 12-pdr Napoleons. 5th Battery: 24 shot, 24 fuse shell, and 132 bullet shell for 3.80-inch James. 11th Battery: 100 canister, 140 fuse shell, and 150 bullet shell for 3-inch rifles. 5th Battery: 32 canister for 3.80-inch Rifles. 2nd Battery: 130 shot and 142 shell for 3.80-inch rifles. 3rd Battery: 52 shot, 273 shell, and 24 canister for 3.80-inch rifles. 5th Battery: 58 canister for 3.80-inch rifles. 7th Battery: 197 shell, 273 case, and 157 canister for 10-pdr Parrotts. 10th Battery: 468 shell, 225 case, and 94 canister for 10-pdr Parrotts. 7th Battery: 217 shot for 10-pdr Parrott. 5th Battery: 150 Schenkl shell for 3.80-inch rifles; 40 Tatham canister for 3.80-inch rifles. Yes, 5th Battery reported canister from three different patterns to feed their James rifles (and that does not include canister for their 12-pdr Napoleons). Would love to see a first hand account discussing those particulars. 2nd Battery: Eighteen rifles (no type specified), twenty-eight Army revolvers, and twenty-two cavalry sabers. 3rd Battery: Four Navy revolvers and ten horse artillery sabers. 5th Battery: One percussion pistol, fourteen cavalry sabers, and seven horse artillery sabers. 7th Battery: Two cavalry sabers and fifteen horse artillery sabers. 10th Battery: Eighteen Army revolvers and twelve horse artillery sabers. 11th Battery: Ten Army revolvers, twelve Navy revolvers, and eleven cavalry sabers. Perhaps the 5th Indiana Battery must have been the last user of the percussion pistol? Next we’ll pick up the bottom half of the Indiana Independent Batteries.